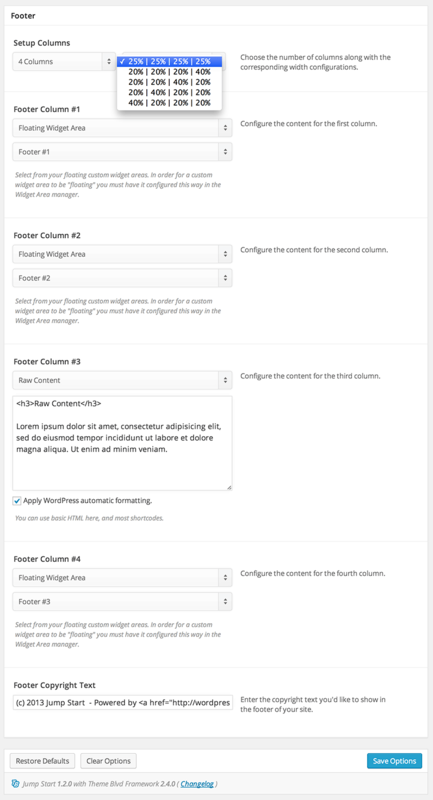 This might be one of the most flexible footers you’ve ever seen in a WordPress theme. I’m not gonna lie to you here, but it’s pretty close to pure, outright voodoo magic. After you’ve installed your Theme Blvd theme, go to Appearance > Theme Options > Layout > Footer and you’ll find something like what you see in the following screenshot. Select your amount of columns and the widths for them all. Then for each column, select your content — Content feed from a page? Content feed from a custom widget area? Or just input some raw content.